In trademark law there is an important term dalled dilution – its when your trademark goes from something unique to something generic. It happened to “asprin” and “gramophone” and nearly caught “Walkman”. Game developer King fear that their trademark “Candy Crush Saga” is being diluted and leeched upon by the competition. Therefore they do what all sensible American companies do: send out legal letters. Forbes has a post on how King is threatening other game developers. First they started the war for the word “Candy” – contacting Apple to have them ban apps containing the word Candy. Now it’s the word “Saga”. One example is Stoic Studios and their game “Banner Saga”. King is opposing their use of the word Saga – but states that ““King has not and is not trying to stop Banner Saga from using its name. 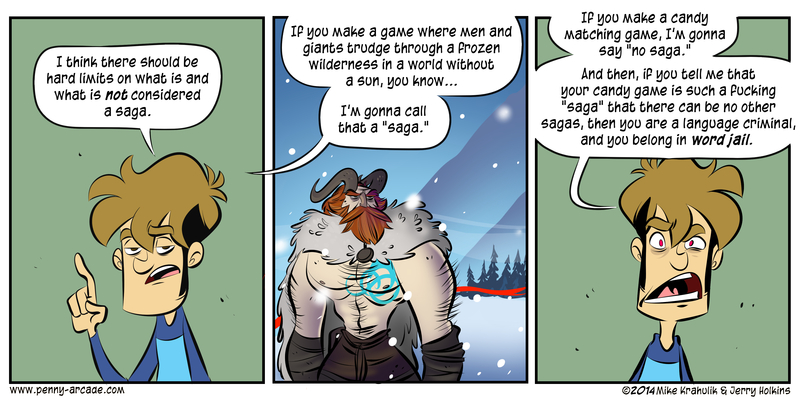 We do not have any concerns that Banner Saga is trying build on our brand or our content. However, like any prudent company, we need to take all appropriate steps to protect our IP, both now and in the future”. Really strange. The funny thing is that the Stoic trademark for Banner Saga predates Kings trademark for Candy Crush Saga. One part of the Forbes article I don’t understand is the part about bleeding Stoic with legal costs. Trademarks can be opposed administratively by the USPTO. Im not sure how that system compares to the European, but in Europe administrative costs are a lot less than going to court. In any way this is a prime example on how companies are using the IP system in a way that is both wrong and harmful to themselves. Maybe I have to reconsider playing that candy game and begin Hayday again.